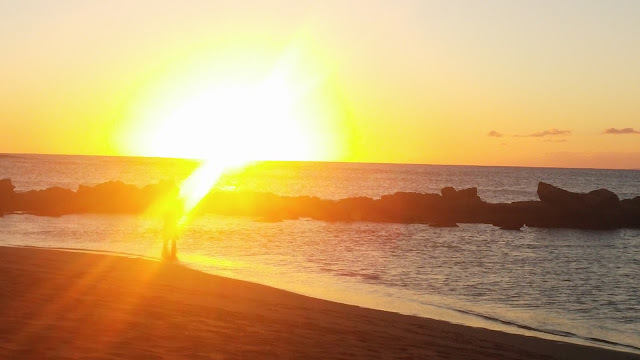 Sunset at Salt Pond Beach, local playing uke, cue whales. We saw four breach that afternoon! I'd love to know who coined the phrase "the fickle winds of fate," but I'll be damned if I can find a reference. All I know is, weather can wreak havoc with a writer. Mentally, for weeks now, weather has been wreaking havoc with my writing. On January 21st, my husband and I flew to Kaua'i, Hawaii, two weeks prior to our daughter's wedding. She lives there, but for all of her siblings (she has five) and all of her mainland guests, this was a destination wedding. Despite Mt. Wai'ale'ale, Kaua'i's second highest peak, being billed locally as the wettest spot on earth, the temperatures on the island range anywhere from 78° to 85°F year round. And—at least on the south side of the island—the sun nearly always shines. Perfect weather for sunbathing, swimming, snorkeling, whale-watching cruises, hiking, ziplining, hammocking and weddings. Writing, not so much. For two weeks plus, I did nothing but play and spend quality time with the husband, the kids, family, friends, and my granddaughter (the grandson is on semester abroad and couldn't be there). And then there was home. Granted, Colorado isn't a bad place to live. We get sunshine 300 plus days a year. What we don't have is a beach! We have had record temperatures the past two weeks, which has helped my reentry; still, it's been hard to focus. I've decided I'd be more prolific if I lived in, say, Michigan. My youngest daughter (who teaches middle school in Grand Rapids and suffers from S.A.D.—seasonal affective disorder) says it's been brutal getting back to her routine, despite the weather making it desirable to be indoors. I have no doubts that some writers suffer from S.A.D., most commonly known as winter depression (it can happen in the summer, too, but that's more rare). The winter blues occur as the days get shorter, light becomes scarce and the weather grows cold. 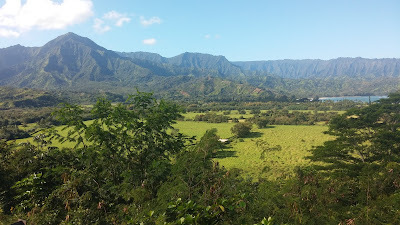 Nothing a trip to Kaua'i wouldn't cure! Writers and poets through time have used weather and seasons to set the scene, drive a plot, and mimic emotion. My first weather encounter in crime fiction came in Agatha Christie's And Then There Were None. In this book (first published in 1939 under a different title), a group of people are lured into coming to an island under different pretexts. Some are there for employment opportunities, others to meet up with old friends, and others for a late summer holiday. The guests all have one thing in common—they all have committed some heinous act, either escaping justice or having never been charged for their crimes. During dinner on the first night, they are informed by a gramophone recording that they have been brought to the island to pay for their sins. They are the only ones on the island, and they cannot escape due to the distance to the mainland and inclement weather. Then, one by one, they are all killed; each in a manner that seems to mimic an old British nursery rhyme, now entitled "Ten Little Soldier Boys." 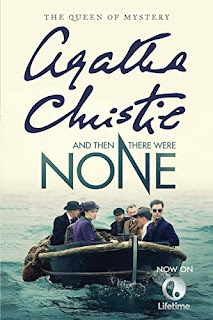 The story ends with a twist, and is Christie's bestselling novel with more than 100 million copies sold. It is also the world's bestselling mystery and one of the bestselling books of all time. Some of today's best crime writers have also used weather to set mood, isolate characters or drive plot. Read: Whiteout by Ken Follett, Shutter Island by Dennis Lehane, Stormy Weather by Carl Hiaasen... Read RED SKY, my most recent novel, due out June 13. In it, I use weather to set scene and to make it more difficult for my protagonist, Raisa Jordan, to acquire much needed intel. My guess is, we can all quote the biggest catchphrase for bad writing, coined by Edward Bulwer-Lytton in his 1830 novel, Paul Clifford. His opening sentence—wait for it—"It was a dark and stormy night..." Writer's Digest described it as "the literary poster child for bad story starters;" while, on the flipside, the American Book Review ranked it No. 22 on its "Best First Lines from Novels" list. Needless to say, the opening has spawned a number of Worst First contests offering prizes to the writer who writes the worst first sentence of an imaginary novel. When I first started writing, I attended a workshop offered in Glenwood Springs, CO, taught by none other than Lawrence Block and Joanne Greenberg. During the week we were there, the two held a contest for the worst first opening line of a novel. I won an honorable mention and a roll of Lifesavers for my entry, "He knew she knew that he knew she knew...."
Weather is out there. It affects us all on a daily basis—getting us outdoors or keeping us in, making us happy or making us sad. It affects the earth, helping plants to grow or making them shrivel. It can wreak havoc in the form of super storms, isolate us on deserted islands or provide a fresh blanket of snow for a spectacular getaway on skis (preferably the antagonist's, making it worse for our hero or heroine). Weather is not something that can be omitted. If your character sees the moon and stars, the sky must be clear. If the ground is wet and slippery, it's likely raining or storming. If your protagonist is wearing a parka, it must be cold; if she's rockin' a bikini, it must be warm. Weather affects everything, but it's something we write inherently. Used with intent, it can produce great things. Think Swiss Family Robinson. 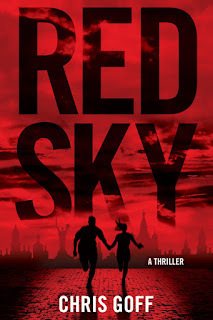 Chris, the cover of your new thriller, RED SKY, is fantastic! I didn't realize the release was so soon--congrats! And welcome home. I'm so thrilled for you and your family that you were able to take 2 weeks off and play. I have a really hard time doing that; I think a lot of writers do. I have to say, you REALLY made the most of your vacation! Thanks for sharing the photos in your last post and congrats to the newlyweds! Chris - great post about how weather IS the major character in so many stories. And I laughed out loud at your "worst opening line" - perhaps we should have a little contest here and ask folks to submit their worst opening line for a novel. Let's see, how about: Dead . . . he really really really was dead." Finally - can't wait to read RED SKY! Amen, Chris. A terrific journey into the relationship between writing & the weather. But what if it really was a dark and stormy night?